PHOENIX — Arizona hunters know that timely rainfall is the elixir that gives the state’s quail populations a much-needed boost. Good winter precipitation particularly benefitted Gambel’s quail, the best-known and most widespread of the state’s three main species. That led to spring call counts that were almost double what they were in 2016 and higher than the average of the last 10 years (2008-2017). Throw in statewide summer rains that sustained forage and habitat conditions, and it was a good year for quail brood survival, with some observers noting young chicks as late as mid-September. So, where should hunters think about going when the 2017-18 season opens Friday, Oct. 6? “Gambel’s quail are very widespread south of the Mogollon Rim, and this year should be better than it has been in a few years,” said Wade Zarlingo, small game program manager for the Arizona Game and Fish Department. 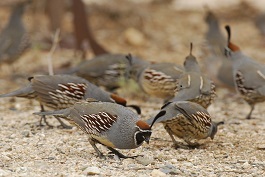 “Game Management Units 44A, 44B and 20C are promising for Gambel’s quail. This area of the state is not traditionally known as a quail hotspot, even though there seems to be a significant increase in populations in this area. When it comes to scaled quail, Zarlingo said Cochise and southern Graham counties should provide the best opportunities. Meanwhile, hunters should note that the season for Mearns’ quail doesn’t begin until Dec. 8. Zarlingo said Cochise and southern Pima counties are the traditional strongholds for these birds. He encourages hunters to focus on oak-grassland or pine-grassland savannas. The general bag limit is 15 quail per day in the aggregate, of which no more than eight may be Mearns’ quail. The general possession limit is 45 quail in the aggregate after opening day, of which no more than 15 Gambel’s, scaled or California quail in the aggregate may be taken in any one day. After the opening of the Mearns’ season, the 45-quail possession limit may include 24 Mearns’ quail, of which no more than eight may be taken in any one day. For more information, visit https://www.azgfd.com/hunting/species/smallgame/quail/. Another resource for both new and experienced hunters alike is “An Introduction to Hunting Arizona’s Small Game.” Written by the department’s Randall D. Babb, the 196-page, full-color book covers where and how to hunt small game birds (like quail), squirrels, rabbits, ducks and geese. It also includes how to prepare and cook your harvest, with illustrations and recipes. The book can be ordered for $16.95 at www.azgfd.gov/publications.